On 7 October 2018, the Republic of Cameroon, a country in the middle of West and Central Africa, will hold presidential elections. Nine candidates were announced by the elections governing body early this year on 7 August 2018. Including incumbent president Paul Biya, who is running to serve his fourth seven year term as president. The election comes at a time when the country is experiencing great tension from the English-speaking territories as politicians from the region have been advocating for greater decentralisation to allow more self-governance of the anglophone territories. The country is torn as separatists in the English-speaking regions have attempted to create the state of Ambazonia. As a result, in November 2017, President Paul Biya declared war on the Anglophone separatists. Violence continues to spread in three regions of the country: the Far North, the Northwest and Southwest, which has resulted in displaced citizens escaping the violences. This context throws a veil of instability over the current presidential election. Unfortunately violence during election periods is an all too familiar phenomenon in many African countries. Moreover, as is often the case, women and girls are among those most affected by the violence. 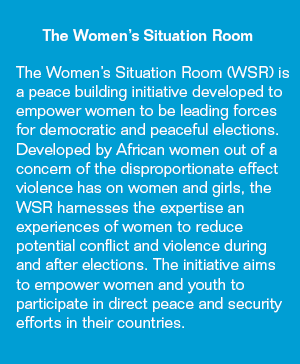 Due to this, women in Africa developed the Women’s Situation Room (WSR) to help reduce violence during and after elections. Cameroon’s WSR has been an effective early warning tool for preventing conflict having reported a good number of incidents from communities. 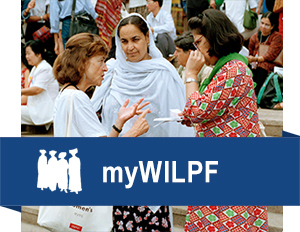 As part of their efforts to prevent violence, in addition to a social campaign encouraging people to vote, WILPF Cameroon has established an election Call Centre with a toll free number, operational from the 4 October to 8 October. The Section has successfully gathered 30 women, trained as tele-operators, who are responding to phone calls from the field and reporting conflicts in a matrix during the election period. Additionally, the centre will also have two analysts, one an expert in electoral analysis, and two media specialists who will be in the room to support WILPF Cameroon with technical expertise. WILPF Cameroon President, Sylvie Ndongmo emphasises that “the physical establishment of the call centre for five consecutive days is an important achievement. It enables the organisations members and partners to build their capacities in new areas including elections monitoring”. Moreover, WILPF Cameroon is the only organisation in the country possessing a hotline number for elections monitoring. As part of this recognition, WILPF Cameroon were invited by the African Union Election Observation Mission to participate in a panel on 4 October 2018 to discuss their work on conflict prevention during elections. Additionally, WILPF Cameroon will speak with the International Francophonie Organisation on 6 October 2018 in regards to their election monitoring work so far. If you wish to report incidents of conflict or violence in regions of Cameroon during and after the elections, the WILPF Cameroon Call Centre toll free number is 8243. Follow along with the social campaign encouraging voting in peaceful elections by following WILPF Cameroon on Facebook and Women’s March Global on Twitter.